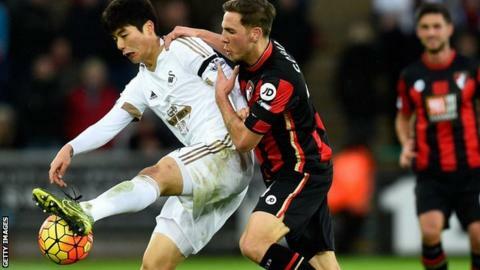 Swansea City fought back from 2-0 down to claim a thrilling draw against Bournemouth. Joshua King and Dan Gosling put the visitors in control to increase the pressure on Swans manager Garry Monk. Andre Ayew's backheel and Jonjo Shelvey's penalty brought Swansea level at the end of a breathless first half. Bournemouth dominated after the break but the point keeps them in the relegation zone, while Swansea remain 14th. Although the Swans remain five points clear of the bottom three, a run of one victory in nine Premier League games keeps the focus on Monk's future. Monk had been under intense scrutiny prior to this match, with the 36-year-old claiming reports he was facing the sack were driven by people with an "agenda". In an attempt to arrest his side's slump, he dropped four first-team regulars - Federico Fernandez, Gylfi Sigurdsson, Jefferson Montero and Bafetimbi Gomis making way for Kyle Bartley, Leon Britton, Wayne Routledge and Eder. One of those recalled was at fault for the opening goal, as Bartley's clearance hit Ki Sung-Yueng and fell to Junior Stanislas, who squared for King to slide in. Swansea were ragged defensively and, after Stanislas had a goal disallowed for offside, the hosts were soon punished again as Gosling rifled the ball high into the net to double Bournemouth's advantage. Gosling's goal prompted boos from the home fans, but they were soon replaced by roars of encouragement as Ayew's audacity halved their deficit. Found by Shelvey's header in the box, Ayew had time to turn but instead backheeled the ball into the net. The Ghanaian also played a prominent role in the equaliser, as he ran on to Britton's through-ball and was adjudged to have been tripped by Simon Francis - although replays suggested Ayew fell over his own feet. Shelvey confidently converted the penalty and, with his team level and the home fans behind them, Monk seemed a little more at ease on the touchline. Bournemouth had won only one of their nine league fixtures prior to this match but, given he is in charge of a newly-promoted side, manager Eddie Howe is under minimal pressure when compared to Monk. The Cherries were still in need of a victory, however, and started the second half as they did the first, controlling possession and pinning Swansea back in their own half. Defender Steve Cook had their best chance, volleying wide from a corner, but in the closing stages it was the hosts who looked likelier to score. Swansea manager Garry Monk: "To be 2-0 down, the players showed great bravery and fantastic spirit to get back. You could feel that tension, it affected us with the ball and our confidence. We need to build that side of it by putting a run of results together. "This is a point gained and a result to put us on the road to getting our confidence. Overall we have to be happy with a point." Bournemouth manager Eddie Howe: "We should be standing here with three points. We're disappointed but there were a lot of positives. "The players are beginning to believe in themselves a lot more, they know they have nothing to fear. I'm very proud to be Bournemouth manager tonight." On Swansea's penalty: "He [Andre Ayew] has induced the penalty but the referee has fallen for it." Swansea have a challenging trio of fixtures coming up, starting with a trip to Liverpool, followed by the visit of surprise high-flyers Leicester to the Liberty Stadium. It concludes with a meeting with Manchester City at the Etihad Stadium. Bournemouth host Everton next, then visit Chelsea before facing Manchester United on home soil. Match ends, Swansea City 2, Bournemouth 2. Second Half ends, Swansea City 2, Bournemouth 2. Jefferson Montero (Swansea City) wins a free kick on the left wing. Substitution, Bournemouth. Shaun MacDonald replaces Harry Arter. Attempt missed. Dan Gosling (Bournemouth) left footed shot from the centre of the box is high and wide to the right. Jonjo Shelvey (Swansea City) is shown the yellow card. Gylfi Sigurdsson (Swansea City) is shown the yellow card for a bad foul. Foul by Gylfi Sigurdsson (Swansea City). Substitution, Bournemouth. Glenn Murray replaces Joshua King. Corner, Swansea City. Conceded by Steve Cook. Attempt blocked. André Ayew (Swansea City) left footed shot from the centre of the box is blocked. Assisted by Jefferson Montero with a cross. Delay in match Harry Arter (Bournemouth) because of an injury. Attempt missed. Jonjo Shelvey (Swansea City) right footed shot from outside the box is high and wide to the right. Assisted by Neil Taylor. Attempt blocked. Jonjo Shelvey (Swansea City) left footed shot from outside the box is blocked. Assisted by Gylfi Sigurdsson. Corner, Swansea City. Conceded by Dan Gosling. Attempt blocked. Neil Taylor (Swansea City) right footed shot from outside the box is blocked. Assisted by Jefferson Montero. Attempt missed. Simon Francis (Bournemouth) left footed shot from outside the box is high and wide to the left. Assisted by Harry Arter. Attempt blocked. Dan Gosling (Bournemouth) right footed shot from outside the box is blocked. Assisted by Harry Arter. Corner, Bournemouth. Conceded by Kyle Bartley. Attempt blocked. Junior Stanislas (Bournemouth) right footed shot from outside the box is blocked. Assisted by Dan Gosling. Substitution, Swansea City. Bafétimbi Gomis replaces Eder. Attempt missed. Steve Cook (Bournemouth) right footed shot from the centre of the box is too high following a set piece situation. Substitution, Swansea City. Gylfi Sigurdsson replaces Leon Britton. Attempt blocked. André Ayew (Swansea City) right footed shot from outside the box is blocked. Assisted by Ki Sung-yueng. Attempt missed. Steve Cook (Bournemouth) header from the left side of the six yard box is close, but misses to the left. Assisted by Matt Ritchie with a cross following a corner. Corner, Bournemouth. Conceded by Ashley Williams.